Zero to 60 mph in 20 seconds – Fully Loaded! 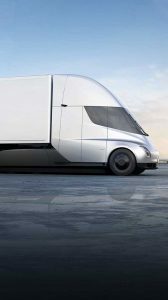 The future of electric freight transport has been unveiled by Tesla. With an anticipated operating cost of $1.26 per mile, the electric semi will be 17% more efficient than its diesel counterpart. Additional highlights presented by Elon Musk include a 500 mile range, “thermonuclear explosion-proof glass” to help truckers stay on the road, and the ability to reach 60 mph three times faster than a loaded diesel truck. Overall, these electric semis should be significantly cheaper to run. “Electric motors have advantages for hauling: fewer moving parts, cheap fuel and zero tailpipe pollution,” NPR’s Emily Sullivan reports. Tesla touts the fuel savings at $200,000 per year. With the Tesla Semi roll-out date in 2019, Tesla is already taking reservations for their Semis. With increased competition and innovation, we hope transportation logistics sees many changes over the coming years.